We have a lady at our church who has breast cancer and is going through chemotherapy. I meant to send her a card this week, but didn’t get one in the mail. 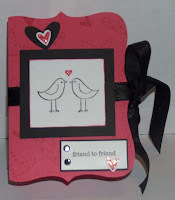 Then I saw this beautiful box “card” on Connie Tumm’s blog. I decided to make one of these for our friend instead. You can see Connie’s box here. Here are some pictures of mine. My husband needed a gift for a coworker’s baby shower today. I made the cutest little card for this baby boy….and forgot to get a pic before he left. Ugh. Anyway, here’s a card for a little girl that is very similar. It is made with the Fast & Fun Notes stamp set. I haven’t used this set much since I got it over a year ago, but it is growing on me. I should probably challenge myself to make a card with each stamp in the set and see how creative I can be….hmmm. I’ll post what I come up with if I take myself up on that challenge. Hope you have a chance to stamp today! I wanted to share this card that I made today. I love how the cute little plaid flowers turned out. Come to my next workshop & I’ll show you how to do this technique. Its been very hot this week and I have gotten to spend a lot of time in my craft room. Yay! Creating always makes me happy. It also means that I have a lot more cards to post. I’ll share more with you tomorrow. We have recently welcomed a new member into our family. Since May is National Scrapbook month i decided to introduce him to you through a scrapbook page. This was created using My Digital Studio. I love creating projects and just playing around with this program. Its a lot of fun. Hunter is only 8 weeks old and very playful. We are enjoying his babyhood as much as possible since he will be growing quite large pretty quickly. 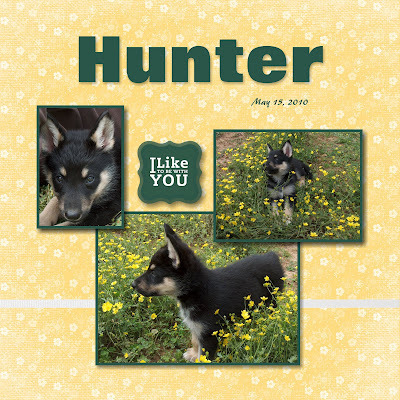 His mother is a full blooded Siberian Husky and his father is a full blooded German Shepherd. The canines at our house don’t out number the humans, yet. Not until Christina goes back to school in the fall anyway. She has been home for about 3 weeks now and we are loving having a more normal family life again. Yay summer vacation! Last month I had to have surgery on my right shoulder. For 4 weeks I wasn’t even allowed to move it. That sort of put a halt on my stamping for a while. I am pleased to announce that surgery went better than expected & I am on the road to recovery. I still have 2 months before I can start any strengthening exercises, and my range of motion is still limited, but I am having less pain and increased movement every day. Needless to say, I am anxious to be stamping again. I have already scheduled 2 classes for June and I am so excited. I hope you’ll be able to join me for one or both of them! I am also excited about the changes that are happening at Stampin’ Up these days. We are saying goodbye to the retiring items in June and preparing for the new catalog that will be available July 1st. There are exciting changes taking place in the Stampin’ Up color palettes, and of course its always exciting to see what the new stamp sets will include. I will be posting pictures of scrapbook pages and recent cards in the next few days so check back soon. Finally a Saturday at home! We travel so much this time of year with Andrew’s gymnastic competitions. It’s nice to relax at the house for a change. Next week we’re off again to Dallas. I’m not complaining, I love to watch him compete! If you like what you see & you want to join me Thursday for some crafty fun you can go here to view my calendar and get the details. What a great weekend we had just relaxing with family. Our friend Joel from Missouri stopped by to visit too. Now it is back to the work/school week. I have been working many hours in my craft room the last several days to prepare swap items for the Stampin Up conference this Friday! So excited about going & about getting to see my family in Indiana. Excited about my craft room too. It is almost done. Now the challenge is organizing & rearranging all my stuff! That will take me a while I’m afraid. I promised my family I would have the ping pong table cleared off by Christmas 🙂 I seriously hope it doesn’t take that long! I’ll try to post some more pics of the room & my projects soon. My dear hubby knew that this week would be hard for me (missing Christina and all). He decided to provide me with an exciting, but time consuming distraction. He is renovating my craft room in the basement. We have been planning this for months. Perhaps he intentionally put it off until now, not really sure. Anyway, it has been fun working on it with him. Thought I’d post some pics of our progress. Still some work to do, but we tackle a little bit each night. I really need to brag on God for this project too. He has amazingly provided our supplies for about $150. That includes cabinets (FREE! ), countertops, paint, hinges,etc. etc. It would probably have been less than $100 but we thought we needed more paint… I am sure some of you can relate. Well, I survived moving Christina into her dorm room—but barely. Seriously, why does life have to be so hard? God reminded me when I woke up this morning that I had been preparing for this day for more than 18 years. He also reminded me how blessed I am to share this exciting chapter of life with my dear child. I thought about the many moms who would love to have that opportunity, but don’t. I am truly blessed. I remember in 2000 I bought a devotion type book entitled “Growing Little Women: Capturing Teachable Moments with Your Daughter.” It was designed for moms to work through with their 9-12 yr old daughters. My daughter was 9 at the time. This is what it said on the back cover—“It seems just yesterday you cuddled your baby girl. Your heart filled with hopes and dreams for her future, and you wanted to give her everything she would need to live a fulfilling life and grow to love God. But season followed season, and now her years under your wing are suddenly half over.” It shocked me and I cried. Half over! How could that possibly be??? It was going too fast! Today she is an 18 year old and tomorrow we move her into her college dorm room. Although I am so very proud of the young lady she has become, I still think it went way too fast. She is excited to begin college life and spread her wings on her own. I am trying not to dampen that excitement with my sadness at her leaving. I know that all mothers face this challenge eventually. You’d think after 18 years we’d be ready for a break and glad to see them move on, but that’s not the way it works out.